Damselflies share their littoral, aquatic habitat with dragonflies and mayflies; they all belong to the same Order: Odonata and have similar environmental needs. Damselflies rarely compete with dragonflies for food or reproduction sites because dragonflies are much larger than damselflies. 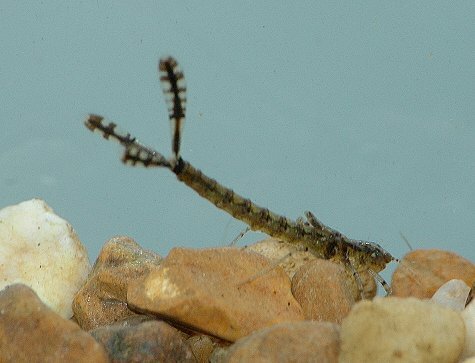 Mayflies have a relatively short adult life stage, so they do not interfere with the damselflies much. Although d amselflies are voracious predators, they are often also a nutrient source for many larger organisms near or in the water. Studies and data about the interactions between fish and damselflies imply that fish, such as the Largemouth Bass, are the main predatory organism in relation to damselflies, but this is not the case! In fact, birds, ants, and spiders account for almost ¾ of the damselflies’ mortalities. 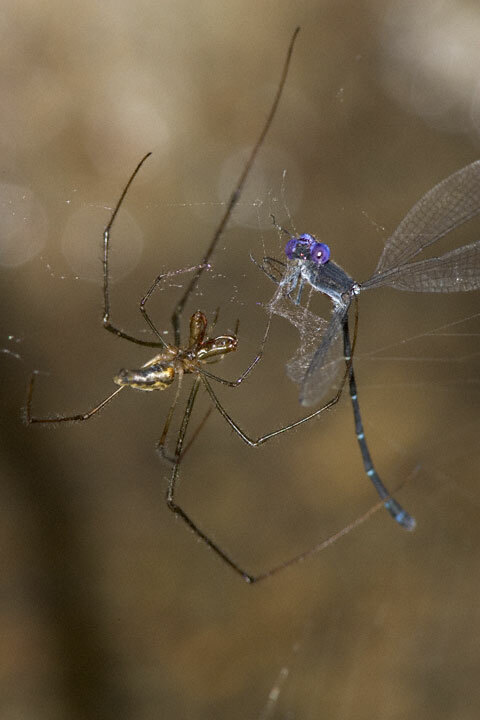 Spiders focus on damselflies when they take their first flight after hatching from the naiad form; at this point, the damselfly is probably not as strong as an experienced adult and is more susceptible to becoming prey. Bird species like the Wood Duck or Mallard may choose to nest and raise families in areas with high concentrations of damselflies. By nesting in these areas, the ducks have access to larger food items for their young. When fish are absent from the aquatic environment, the Tree Swallow thrives on damselfly adults especially when feeding nestlings. 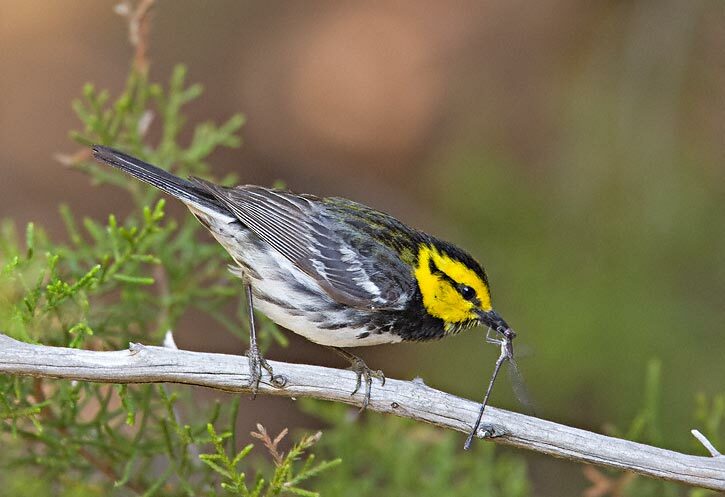 One study found that the prevalence of damselfly adults in an area strongly influenced the eating and foraging patterns of four Red-winged Blackbird species. The naiads do not have a free pass from predation, though, because there are large aquatic insects that choose to feed on the naiads. The Giant water bug (Order Hemiptera) feed on damselfly naiads because they can physically overtake them. Predaceous diving beetles (Order Coleoptera) also pose a threat to naiads in their aquatic environment. Parasitic wasps plague damselflies too. Polynema is one of the smallest insects identified by mankind and could hide under the dot at the end of the sentence. The parasitic wasp swims until it discovers damselfly egg clusters; it then proceeds to lay one of its own eggs into each of the damselfly’s eggs. Unfortunately for the damselfly, the wasp eggs hatch, and the larva eats the damselfly’s eggs for nutrients. Ready for some fun facts? You can use them to surprise your friends with how much you know about damselflies!